Media statements released by SUARAM. ABOLISH ISA: THE TOOL OF INJUSTICE AND POLITICAL ARBITRARINESS! 27th October 2010, marks the 23rd Anniversary of one of the countries biggest political crackdown; the infamous Operasi Lalang, The Operasi Lalang saw the arbitrary arrests and detention without trial of 106 persons ranging from the Parliament Opposition Leader and members of Parliament to trade unionists, Chinese education movement leaders and non-governmental organization (NGO) activists who were working on the issues of environmental protection, women, workers rights etc under the Internal Security Act (ISA). Other victims of the Operation were two dailies, The Star and the Sin Chew Jit Poh and two weeklies, The Sunday Star and Watan which had their the publishing licenses revoked. Until today, the 1987 mass arrest remains as the pillar of political arbitrariness and injustice in a democratic nation that have achieved its independence 53 years ago. It’s an affront to our democracy and independence that ISA were engineered by the colonial masters continues to be used on its citizens and people for their legitimate political and dissent activities. This year mark the 50th year of the draconian act being in power with the scope of the ISA broadened and the list of its “victims” has grown ever longer. Over the years the ISA was amended 19 times with every amendment further diluting the fundamental rights and incrementally extended Executive powers and judicial safeguards. In 1989 the government has amended Section 8B of the ISA to deny legitimate legal redress for a Judicial Review. The ISA also since then have been used to arbitrarily detain people said to be members of alleged religious groups, students, professionals, politicians, political and human rights activists and even journalists. The 1987 Operasi Lalang marks the significance of being the single most operation that have detained and incarcerated people from the full spectrum of the political citizens of the country. The ISA has since become a convenient political tool to clampdown on dissent where the Executive continues to enjoy permanent, unfettered discretion to determine, according to their subjective interpretation on any activity and person as a potential threat to national security and of their detention. The unjust law has also created a climate of impunity and abuse of power with arbitrary powers extended to the police to arrest, detain and torture any person without being subjected to any accountability or judicial check and balance. The ISA in its investigation have often clearly contravened international humanitarian standards and religious principles of humane treatment of a person with dignity. As such the ISA is contrary to fundamental principles of international law, including the right to liberty of the person, to freedom from arbitrary arrest, to be informed of the reasons for arrest, to the presumption of innocence, and to a fair and open trial in a court of law. The ISA is also prejudicial to development of human rights and democracy with its wider, intimidating effect on civil society, and a marked influence on the nature of political participation, democracy and accountability in Malaysia . It’s a shame that despite 53 years of Independence from the British Colonial Masters, the government continue to defend the ISA and turning the blind eye on the critics and calls made by many Malaysian to repeal this draconian law. The act reveals the lack of political will to address the view of the people and its commitment to human rights and democracy. This is seen with the futile and failing effort by Prime Minister Najib Tun Razak to review and amend the ISA that remain a mystery and merely as a political gesture. 1. Abolish all existing unjust laws such as the ISA, EO (Emergency Ordinance), DDA (Dangerous Drugs Act), and the RRA (Restricted Residence Act AND to release, or charge all those detained under this laws in an open court) with an immediate effect. 2. Close down immediately all detention centres for detainees held without trial, such as Kamunting and Simpang Renggam. 4. Awards compensation to all those who have been detained without trial, for being unjustly deprived of their liberty and denied their due rights. 5. Makes a public apology to all such detainees, past and present, and compensates them for the injustice, abuse and suffering inflicted on them during and as a result of their detention. 6. Investigates all complaints and cases of abuse, torture, inhuman treatment and abuse of power perpetrated on any detainees, past or present; prosecutes those responsible and sets up the Independent Police Complaints and Misconduct Commission as proposed by the Royal Commission on Police in 2005. 7. Recognizes respects and restores the proper powers of the judiciary, as an independent body, to provide a check and balance on the power of the police and executive, and repeals all laws which have removed such judicial oversight. 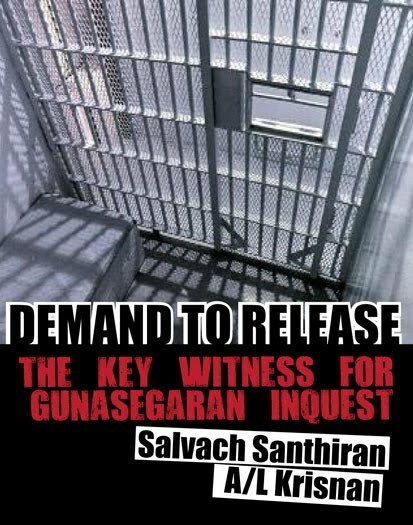 SUARAM condemns the police beating and arrest of K. Selvachandran, a witness in R. Gunasegaran’s death in custody inquest. He had testified during the inquest that he saw Lance Corporal Mohd Faizal Mat Taib assaulted Gunasegaran before the suspect collapsed and died. 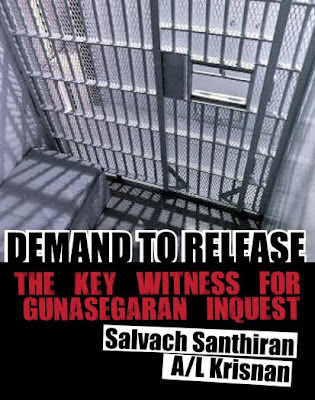 On 25 October, the coroner’s court gave an “open verdict” into R Gunasegaran’s inquest because the cause of his death while in police custody could not be conclusively proven. On the same day, K. Selvachandran was arrested at his home around 10pm by 5 plainclothes police officers and beaten up in front of his wife and children before he was taken away to the KL police contingent headquarters. The officers told Selvachandran’s wife, S. Saraswathy that he would be detained for 60 days, and may be extended to an additional 2 years. It should be noted that only 3 laws allow for such a long period of detention, namely the Internal Security Act, the Dangerous Drugs Act (Special Preventive Measures) and the Emergency Ordinance. SUARAM demands for the immediate release of Selvachandran and calls for Inspector-General of Police, Tan Sri Ismail Omar to walk the talk of his 4P (Proactive, Protective, Performance-oriented and People-oriented) plan by first curbing the culture of lawlessness and abuse of power in the police force as exemplified in the death of Gunasegaran and detention without trial of Selvachandran. The IGP must ensure that police officers adhere to the laws and procedures that govern the arrest and detention of suspects, and they cannot act as they pleased to retaliate against a witness who testified against them. What message is being sent to other potential witnesses other than a strong warning not to testify against the police? SUARAM also calls for the implementation of the IPCMC as recommended by the Royal Commission on the Police in 2005 to hold the police accountable over abuse of power and human rights as clearly proven time and time again; the police cannot be relied upon to investigate themselves. Polis DiRaja Malaysia (PDRM) memainkan peranan yang berbeza dan jauh lebih penting berbanding dengan Negara-negara lain di Asia Tenggara. Di negara-negara lain di Asia Tengara, pihak tenteralah yang memainkan peranan penting dalam memastikan kestabilan politik parti pemerintah di Negara tersebut. Kestabilan politik dan keselamatan Negara sebenarnya tidak ada kaitan dengan faktor luar seperti ancaman tentera dari Negara lain, tetapi ia lebih menumpu kepada kestabilan, keselamatan dan ketenteraman parti pemerintah di Negara-negara tersebut. Pembelian alatan tentera dan sebagainya lebih merupakan satu projek untuk mendapatkan komisyen dimana ia dapat disembunyikan dibelakang akta rahsia dan soal keselamatan Negara. Dibanding dengan Negara lain, tentera memainkan peranan penting, kita dapat lihat bagaimana di Negara Burma (Myanmar) demokrasi terkubur kerana pemerintahan tentera. Di Thailand, mana-mana kerajaan hanya boleh memerintah jika ada sokongan tentera. Begitu juga di Filipina dan Indonesia. Di negara-negara ini, pemimpin terpaksa mempunyai hubungan dengan pihak tentera kerana sokongan tentera boleh menentukan berjayanya atau kecundang sesebuah pemerintahan. Di Malaysia, agak berbeza dimana peranan yang biasanya dimainkan oleh tentera ini dimainkan oleh polis. Polis menjadi rakan yang paling penting dan berpengaruh untuk memastikan kerajaan BN terus memerintah. Justeru itu adalah penting untuk pemerintah memastikan polis sentiasa memberikan kerjasama kepada mereka dan akur dengan arahan mereka. Peranan yang dimainkan oleh Jabatan Cawangan Khas begitu penting. Cawangan Khas terlibat langsung dalam menghancurkan pelbagai gerakan pekerja dan gerakan kiri dari dalam. Mereka diberi penghargaan atas peranan mereka memerangi Komunis pada satu masa dulu. Pernah seorang tahanan ISA diberitahu oleh SB semasa interrogation ISA. Kami polis boleh menentukan siapakah Perdana Menteri Negara ini. Tiba-tiba kemalangan boleh berlaku dan sebagainya. Senjata paling berbeza Pemerintah pula adalah ISA dan untuk menggunakan senjata ini, peranan polis amat penting. Oleh yang demikian tanpa kerjasama polis, ISA tidak boleh dilaksanakan. Seperti yang kita tahu, ISA digunakan untuk menumpaskan gerakan pelajar pada tahun 1974, Operasi lalang pada tahun 1987, digunakan terhadap Reformasi pada tahun 1998 dan baru-baru ini digunakan untuk menentang Hindraf pada tahun 2007. Selain itu, dalam menghancurkan politik Anwar, polis digunakan dengan berleluasa dari aspek memanupulasi bukti, mendera saksi dan sebagainya. Kes liwat terhadap Anwar adalah satu sirkus yang dikendalikan dalam Mahkamah Kajang. Semasa kes liwat Anwar pertama, Musa Hassan sebagai saksi polis telah berkata beliau sedia menipu jika ianya diperlukan. Kini dalam kes liwat Anwar ke 2, polis terus terlibat. Dalam isu Altantuya pula, dua orang Pengawai Polis dari UTK terlibat secara langsung dalam pembunuhan Altantuya. Apakah motif mereka dan siapakah dibelakang mereka? Mengapa tidak ada rekod di imigeresan bahawa Altantuya ada memasuki Negara. Sekali lagi polis memainkan peranan. Bagaimana dua tertuduh sehingga hari ini, ramai yang tidak tahu apakah rupa mereka. Selepas sahaja Tsunami pilihanraya 2008, dan semasa Anwar bercakap tentang hendak mengambil-alih Parlimen. Pada ketika itu, tiba-tiba polis dan tentera memulakan latihan bersama dan ini juga dikendalikan dan ketuai oleh Polis. Justeru itu, peranan polis begitu penting berbanding dengan tentera. Untuk sekian lama, Perdana Menteri akan memegang jawatan Menteri dalan Negara kerana menerusinya boleh mengawal polis dan boleh menggunakan ISA untuk menangkap musuh politik dan membenteras gerakan rakyat.Tren ini hanya berubah semasa penggal akhir Dr. Mahathir dimana beliau telah menjadi Menteri Kewangan `apabila melihat bahawa mengawal sumber kewangan adalah lebih penting pada zaman moden ini’. Begitulah reputasi polis sehingga Malaysia sering dikatakan Negara Polis. Police State. Pada Oktober 2006, Mahathir berkata Badawi telah menjadikan Malaysia sebuah Negara Polis. Oleh yang demikian, Polis adalah satu institusi yang amat kuat dan berpengaruh. Gerakan demokrasi dan hak asasi sering meminta polis untuk akur kepada rakyat dan bersikap profesional. Bagi Polis, kesetiaan mereka adalah kepada kepimpinan tertinggi polis dan kepimpinan tertinggi ini adalah budibicara parti pemerintah. Oleh yang demikian, secara jujur adalah amat sukar untuk menuntut polis bersikap neutral. Polis adalah sebahagian daripada sistem dan idelogi parti pemerintah. Namun kempen selama ini adalah untuk menuntut polis bersikap adil, jujur , profesional dan mematuhi undang-undang. Bolehkah Polis membuat reformasi dalaman? Saya berpendapat ia adalah mustahil selagi polis terikat dengan keputusan politik dari parti pemerintah daripada boleh mengambil keputusan secara bebas dan profesional. Organisasi Polis Moden di Malaysia bermula pada 25 Mac 1807 hasil termaktubnya Piagam Keadilan (Charter of Justice) oleh penjajah Inggeris di Pulau Pinang. Sistem ini mencontohi sistem tersusun dan teratur polis British, yang dicipta oleh Sir Robert Peel pada tahun 1829. Konsep “Bersedia Berkhidmat” diperkenalkan oleh Pesuruhjaya Polis Tanah Melayu Sir Arthur E. Young pada 15 Disember 1952. Menurut beliau tujuan cogankata ini adalah menegaskan pendekatan polis terhadap orang ramai serta mewujudkan persefahaman terhadap kedua-dua pihak. Beliau juga berharap dengan konsep “Bersedia Berkhidmat” ini, pandangan negatif pasukan dapat dikikis dan sebaliknya dihormati. Maka reputasi polis memang mempunyai masalah sejat sebelum merdeka lagi. at juga Persataun yang tarik diri dari menjadi penganjur bersama dan sebagainya. Namun 2 tahun selepas insiden ini pada tahun 1998, majoriti rakyat Malaysia terutamanya komuniti Melayu bangkit menentang polis ekoran isu mata hitam DS Anwar Ibrahim. Ini mungkin kali pertama ribuan rakyat turun protes di jalanraya menuntut Ketua Polis negara pada masa itu Tan Sri Rahim Noor dipecat. Insiden tersebut telah membongkarkan banyak perkara. Pertama Datuk Sri Anwar Ibrahim telah ditahan dalam satu operasi oleh UTK ala Ninja pada 20 September 1998. Beliau telah dibawa ke Bukit Aman dan dimasukkan dalam lock-up. Mata beliau ditutup dengan kain dan tanganya diikat. Beliau kemudian dibelasah oleh orang yang pada masa itu beliau tidak ketahui tetapi mensyaki Ketua Polis Negara sendiri menerusi suara. Anwar kemudian ditahan dibawah ISA. Beliau tidak dibenarkan berjumpa dengan sesiapa termasuk peguam. Namun Ketua polis Negara dan PM mengatakan Aawar selamat tetapi hanya kemudian baru diketahui bahawa penahanan ISA adalah untuk membolehkan mata hitamnya pulih. Polis menyiasat aduan mata hitam Anwar ini yang menjadi isu hangat di dalam dan di peringkat Anrtarabangsa. Seorang Bekas Timbalan Perdana Menteri tiba-tiba dibelasah dalam lock-up. Jika ini boleh berlaku kepada bekas Timbalan PM bagaimana pula dengan rakyat biasa. Rakyat tidak dapat menerima lojik ini dan cukup marah. Insiden ini berlaku dalam lock-up, Anwar diikat dan dibelasah. Masa insiden berlaku adalah sebelas malam. Mengikut prosedur lock-up, selepas 6 petang, seorang tidak boleh lagi disoal siasat. Polis mengambil berbulan-bulan untuk menyiasat kes ini dan akhirnya pihak Pendakwaraya Peguam negara mengatakan bahawa tidak ada bukti cukup untuk menuduh mana-mana pihak. Perdana Menteri pada masa itu Dr. Mahathir pula berkata Anwar mungkin pukul diri dia sendiri. Seluruh masyarakat sivil dan anatarabangsa tidak dapat percaya bahawa polis masih tidak dapat menyelesaikan satu masalah yang berlaku dalam ibu pejabat mereka. Akhirnya atas desakan dan protes orang ramai, Perdana Menteri terpaksa memanggil untuk satu Suruhanjaya diraja menyiasat inisden ini dan dalam inquiry tersebut, akhirnya Rahim Norr mengaku beliaulah orang yang belasah Anwar Ibrahim. Dapatkan polis menyiasat diri sendiri? Setelah berbulan-bulan polis siasat, mereka masih tidak dapat mencari siapakah penjenayah yang pukul Anwar. Jika satu salahguna kuasa dilakukan oleh pegawai bawahan, kita boleh berkata tindakan itu adalah isolated tetapi dalam insiden ini, Ketua Polis Negara sendiri terlibat. Beliau memecahkan hampir semua undang-undang yang ada, mencabul hak orang tahanan, mendera dan mencederakan mangsa dalam tahanan. Jika seorang IGP boleh berlakuan begini, apakah ini menunjukkan mengenai polis itu sendiri secara keseluruhan. Tetapi respon polis adalah mereka telah menukar kepada moto baru MESRA, CEPAT DAN BETUL sempena sambutan Peringatan Hari Polis ke-192 pada 25 Mac 1999. Setelah 192 tahun instusi polis moden diperkenalkan, barulah polis telah berhujah mengenai KHIDMAT MESRA (Friendly Policing). Selaras dengan itu semua pegawai dan anggota polis kena memakai lencana baru MESRA untuk menunjukkan komitmen mereka. Poster dan pelekat dan car sticker juga dibuat untuk memperingatkan polis mengenai tugasan mereka. Pada sekitar tahun 2002, insiden kematian dalam tahanan polis dan tembak mati yang dilakukan oleh polis semakin mendapat liputan. Police watch mendakwa satu kematian setiap dua minggu dalam lock-up polis. Pada tahun 2003 sahaja, 23 mati dalam tahanan polis. Ini adalah satu rekod pada masa itu. SUHAKAM sendiri sejak penubuhan pada tahun 2000, telah menjalankan 5 inquiry awam mengenai salahguna kuasa polis dan banyak daripada hasil siasatan mendapati polis bersalah. Kempen dari orang ramai, protes dan lain-lain. Liputan media yang meluas telah menyebabkan, Perdana Menteri pada masa itu Datuk Seri Abdullah Badawi membentuk suruhanjaya Diraja untuk menambahbaik pasukan polis. Suruhanjaya ini dibuat untuk memodenkan pasukan polis, menambahbaik perkhidmatan polis dan keberkesananya, membasmi rasuah dan salahguna kuasa polis dan mengembalikan keyakinan keyakinan orang ramai terhadap polis. Suruhanjaya ini akhirnya telah memberikan 125 cadangan termasuk satu cadangan untuk pembentukan satu Suruhanjaya bebas menyiasat salahlaku polis – IPCMC. Laporan ini juga cukup comprehensive dan memberikan banyak cadangan yang jika diimplementasi sudah pasti akan mereformasi Institusi polis. Laporan ini juga berkata bahawa Rasuah mesti ditangani dan rasuah berlaku disemua peringkat polis dan adalah amat memudaratkan dan serius. Poll yang dibuat oleh media tempatan terus menyokong pandangan ini dan meminta IPCMC ditubuhkan. Respon Polis adalah cukup standard. Mereka telah membuat satu soalselidik dibalai dan kemudian mengumumkan lebih 90% rakyat Malaysia amat puashati denagan khidmat polis. Mereka kemudian telah memperkenalkan satu lencara yang tertulis ‘Saya Anti Rasuah’. Polis diberi peluang samada mereka mahu pakai atau tidak. Hampir semua memakainya. Maka kita boleh melihat sebahagian besar daripada reformasi yang cuba dibawa oleh polis adalah berbentuk kosmetik sahaja seperti lencana mesra dan lencana anti rasuah. Kini slogan baru polis adalah Tegas, Adil dan Berhemah menggantikan Mesra, Cepat dan Betul sementara cogan kata Integriti Amalan Kita menggantikan Saya Antirasuah. Baru –baru ini survey oleh The Merdeka Center dikalangan 1,028 pegundi di Semenanjng Malaysia antara Mei 6 sehingga 16 Mei mengenai isu Aminulrasyid Amzah yang ditembak mati polis mendapati 58% tidak puas hati dengan polis, 25 puas hati manakala lain tidak memberi reaksi. Reaksi polis adalah mengugut dan akan suruh polis untuk tidak bertugas jika rakyat tidak puas hati. Di Johor sendiri kita telah melihat kes Cheng Lee Whee, seorang sukarelawan di Suaram Johor Bahru ditahan menurut Seksyen 28, ISA kerana beliau telah membuat aduan berkaitan perobohan rumah di Kampung Baru Plentong Tengah, Johor Bahru. ka inilah Polis. Mereka tidak suka dikritik. Setiap kali ada tentangan terhadap mereka, mereka akan membuat beberapa perubahan kosmetik tetapi dari segi isi sebenarnya tidak ada banyak yang berubah. Oleh yang demikian, terbukti kita memerlukan satu badan bebas sepeti IPCMC untuk menyiasat salahlaku kuasa polis. Polis tidak boleh menyiasat diri sendiri seperti kini tuduhan terhadap Kugan dan banyak lagi kes-kes lain yang melibatkan polis. Aduan kepada Jawatankuasa Tataterbib – isu disiplin. SUHAKAM – tetapi polis tidak mahu beri kerjasama dan inquiry dan akhirnya SUHAKAM terpaksa mendapat kebenaran atau lampu hijau dari Ketua Setiausaha Negara. Suruhanjaya Diraja untuk menambah baik Pasukan Polis memberi 125 cadangan dan antara cadangan yang paling maju adalah memberikan kerajaan setahun untuk mengimplemtasi IPCMC pada Mei 2006, setahun selepas dicadangkan tetapi sehingga kini, setelah 5 tahun ia masih belum dilaksanakan. Tetapi apabila IPCMC pertama kali diungkitkan, maka polis mengamuk. Mereka tidak setuju dan mereja juga telah mengugut kerajaan untuk tidak implementasi. Walaupun antara Pesuruhjaya ini adalah bekas Ketua Polis Negara – Tun Haniff Omor. Namun cadangan IPCMC ini mendapat bantahan keras dari anggota polis. Bila undang-undag seperti IPCMC ingin ditubuhkan di Hong Kong , memang reaksi yang sama telah diberikan oleh polis termasuk mogok tetapi di Hong Kong kerajaan disana ada kewibawaan politik dan oleh yang demikian mereka berjaya membina Insitusi bebas dan antara yang paling disegani diperingkat dunia. Apabila ditanya- mereka berkata kejayaan mereka adalah disebabkan Kerajaan disana mempunyai kewibawaan politik untuk membentuk badan seperti IPCMC. Pada June 2009, menjawab satu soalan dari Pesuruhjaya hak asasi manusia bangsa-bangsa bersatu, kerjaaan Malaysia berkata bahawa kerajaan dalam proses membentuk satu badan bebas dan berkecuali tetapi bukan IPCMC. Badan baru ini dikatakan ada skop yang lebih besar dari IPCMC dan akan meliputi agensi kerajaan lain dan dalam proses perbincangan di Parlimen. The Independent Police Complaints Misconduct Commission (IPCMC) telah mengeluarkan cadangan mereka pada tahun 2005 dan telah deraf satu bill yang mempunyai 104-klausa dan memberikan dateline untuk Mei 2006 diimplementasikan. Tetapi pada Disember 2007, kerajaan telah cadangkan satu bil lain untuk mengantikan IPCMC iaitu Special Complaints Commission (SCC) Bill. SCC begitu teruk dimana Ketua polis negara dan MACC duduk dalam suruhanjaya baru ini. Apakah ia ini adalah bebas dan berkecuali? Kemudian SCC tidak dibentang dan kemudian pada tahun 2009, the Enforcement Agencies Integrity Commission Bill digubal dan diluluskan dalam dua Dewan pada 30 Jun 2009 and 9 July 2009. Bill ini telah digazet pada 3 September 2009. Undang-undang baru ini sekali lagi tidak mempunyai kuasa seperti IPCMC. EAIC tidak mempunyai kuasa mendakwa , akan fokus 21 agensi dan bukan polis sahaja. Matlamat asal IPCMC kini telah dicairkan.Tetapi sehingga kini EAIC masih belum dilaksanakan dan akan diletakaan dibawah Jabatan Perdana Menteri. IPCMC memang independent, dan ada kuasa mendakwa yang badan-badan seperti SUHAKAM tidak ada. Maka mungkin itu sebabnya ianya tidak dilaksanakan. Inilah scenario yang ada. Namun demikian jika dibanding, banyak kemenangan yang diperolehi kebelakangan ini. Kesemua ini adalah disebabkan desakan, kempen dan protes rakyat yang berterusan. Tempoh Reman dari 14 hari sudah jadi 7 hari untuk kesalahan kecil. Panggilan telefon untuk peguam dan ahli keluarga. Polis adalah satu institusi yang menjadi faktor menapa BN dapat berkuasa sekian lama. Namun demikian, dalam zaman multimedia yang cukup canggih ini, adalah amat sukar untuk melakukan penyelewengan dan menyembunyikannya. Dalam suasana ini, memang ada peluang untuk rakyat mereformasi polis namun ianya bukan semudah itu. Namun adalah amat perlu untuk polis didesak mengikut etika kepolisan dan profesional menjalankan tugas. Dan perlu ada institusi untuk mengawal polis dan gerakan rakyat mesti berterusan untuk memastikan polis itu akur kepada kehendak rakyat. Gerakan Mansuhkan ISA (GMI) and Suara Rakyat Malaysia (SUARAM) express its protest and disappointment over the latest arrest of seven immigration officers and two foreigners alleged for being involved in human trafficking activities (Source: Berita Harian Online). The detention of the nine under the infamous Internal Security Act (ISA) is yet another attempt by the government to legitimize the usage of detention without trial despite the public criticism and upon the Prime Minister’s public admission that the ISA is indeed problematic and need to be reviewed. GMI & Suaram views that the usage of ISA against these individuals are against the fundamental principles of human rights, justice and international human rights standards and pose and inherent danger of abuse of power particularly in terms of torture or cruel and degrading treatment of detainees. GMI and SUARAM strongly condemn the new arrest under the ISA. GMI and SUARAM would like to know why the government invoked ISA against them even though the country have specific law being the Human trafficking law to curb the Human trafficking activities? GMI and SUARAM values that the security of the country is of utmost importance and does not condone any human trafficking activities, but one’s entitlement to a fair trial should not be deprived on any basis. In the interim, the Government must immediately guarantee safety of the detainees and he/she should be allowed legal assistance immediately. Under the ISA, detainees can be held for up to 60 days in secret locations and in solitary confinement, often in a windowless cell where they lose all sense of time and are at risk of torture and other ill-treatment. We strongly criticize the Government for practicing double standards on issues related to ISA. On one hand, it plans to review the ISA but on the other hand, new detention is carried out discreetly as no prior announcements were made. This incident exhibits that the ISA, is an arbitrary law and has been abused in the pretext of national security for political reasons. We urge the government to charge the said detainees in an open court; otherwise, they should be released without any delay and unconditionally. GMI and SUARAM urge the people of Malaysia to demand for the release of all ISA detainees and for the abolition of this unjust law left behind by the colonial masters once and for all. For 50 years the ISA has been the symbol of injustice and torture in Malaysia. SUARAM strongly condemns the police for the arrest and detention of 4 legal aid volunteers who were distributing pamphlets on police remand powers. Those arrested were lawyers Jason Kong & Chan Khoon Moh; and chambering students Norashikin & Mohd Azwan, from the Bar Council’s Legal Aid Centre (LAC). They were arrested while distributing the Bar Council’s “Red Book: Police and Your Basic Rights” to members of the public at a mall in Bukit Jalil, part of the activities of the National Law Awareness Week recently launched by the Bar Council. It should be noted that the police officers did not follow procedures in their questioning of the volunteers by forcibly compelling the volunteers to follow them to IPD Sungei Besi by holding onto their identification cards. This is a clear violation of police procedure, since the four of them were not suspects in any criminal case. SUARAM is concerned with the arbitrary arrest and detention of the volunteers as it is a blatant abuse of power and shows disregard for the human rights principles enshrined in the Federal Constitution and the Universal Declaration of Human Rights. Article 19 of the UDHR states that “Everyone has the right to freedom of opinion and expression; …and to seek, receive and impart information and ideas through any media… regardless of frontiers.” Article 10(1) of the Federal Constitution also guarantees the freedom of speech and the right to assemble peacefully of every Malaysian citizen. SUARAM is also disturbed to learn that the reason given in arresting the lawyers was having materials deemed to be “anti-police”. SUARAM is of the view that it is the right of citizens and organisations to hold and impart critical opinion on a public administration due to the fact that the police are directly accountable to the public. The practice of deeming a document “anti-police” and subjecting the persons to arrest and detention is unacceptable in a democratic country like Malaysia. SUARAM demands that the newly appointed Inspector-General of Police, Tan Sri Ismail Omar to walk the talk of his 4P (Proactive, Protective, Performance-oriented and People-oriented) plan by stopping the use of intimidation by police officers in the discharge of their duties. The IGP should also ensure that police officers practice the principles of human rights in their duties and also that policing is more compliant to the standards of human rights and prescribed laws. SUARAM also calls for the implementation of the IPCMC as recommended by the Royal Commission on Police to hold the police accountable over their abuse of power and human rights. If anything, the PDRM should realise that any initiatives to empower citizens with the knowledge of their rights in terms of police powers would also benefit the PDRM in the long run, at the very least in lessening the instances of people impersonating police officers. SUARAM also hopes that the irony of the lawyers’ arrest for distributing a pamphlet; launched in 2006 by de facto Law Minister Datuk Seri Nazri Aziz; and which provides information on what to do when stopped, arrested or questioned by the police; is not lost on the IGP.